A challenging night with lots of thick cloud passing through and variable seeing. Lots of technical issues at start of night and poor seeing, but second half of night proved much better with 5 blocks observed in good seeing. Good to be back on-sky with HRS, but had a bunch of payload problems & mirror alignments along the way before being shut down by the humidity. Others: Alexei and Lisa. Luke and guest for a visit. Another frustrating night with the humidity hovering around the limits and some cloud passing by. Frustrating night, either too cloudy or too humid. Kept opening and closing, but completed only a single science block for 2013-2-RSA-005 (monitoring central stars in planetary nebulae). A stormy afternoon followed by a heavy cloud start to the night that suddenly cleared at midnight. A cloudy start that cleared beautifully with variable seeing. Spectacular lightning storms in the distance to the north and the east (low on the horizon and no danger to us, phew), and a rather big fire on a hill to the north-west. Stormy afternoon and a foggy night. Did not open. Cloudy start of the night that quickly developed into ridge cloud (also known as fog). Did not open up. Others: Japanese film crew outside. Thea and David dB with guests for a quick tour. Keith and Paul for a callout. Very cloudy night. Got some observations at the beginning of the night, closed for most of the night, and had a surprise gap towards the end of the night! first and a couple of short spectroscopy blocks in addition. Well finally a full night, gray and dark and clear, but with quite variable seeing. Humidity stayed just within limits. 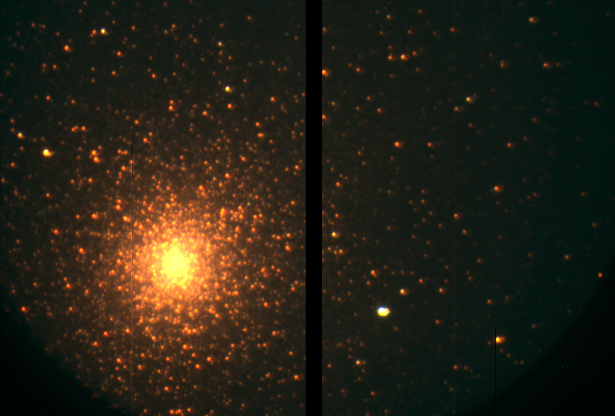 NGC 2808 is one of the oldest known globular clusters in the Milky Way. It is located in the constellation Carina and it is 31,000 light years away from the Earth. The image is a composite image from SALTICAM of three images taken in the SDSS u,g,r filters and the black region in the center of the image is the gap between the two SALTICAM CCD chips. A SALT image of DEM L241, an HII region containing a supernova remnant, in the Large Magellanic Cloud. 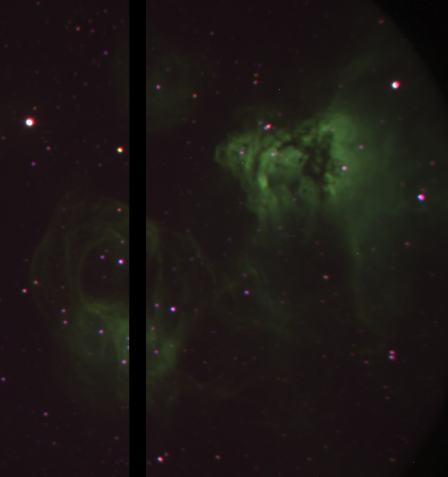 The almost ghostly, green clouds seen in this image are emission from hydrogen gas in the cloud and remnant. Astronomers are using SALT to study the binary star at the center of the supernova remnant. The empty black region in the image is the gap between the two CCD chips that make up the SALTICAM imager. - a full night of observing with seeing keeping below 2'' for most of the night, getting as good as 1''. had thin cloud coverage for the whole evening. - had a later than planned start to the evening due to clouds. opened up to good seeing. had patches of cloud during the night. closed at 03:00 due to high humidity. - had mediocre to bad seeing. closed around 01:30 due to high humidity. - a clear night with mediocre seeing. we had high humidity just after one. closed for a while then opened again with the dew point temperature hanging around the closing limit. the humidity finally got us before twilight. This is the first of what we anticipate will be a number of postings on results of the SALT High Resolution Spectrograph (HRS) Science Verification programs. This post comes from edited highlight of Vladimir Elkin's (University of Central Lancashire, UK) report concerning his and Don Kurtz's (UCLAN) program entitled "A search for rapid oscillation in spectroscopically selected chemically peculiar stars". Three stars were observed with HRS, providing data that were of good quality and suitable for the aim of determining radial velocity variations. In the case of one star, HD42659, Vladimir was able to compare the HRS data with similar observations obtained with UVES on the VLT at ESO in Chile. In the plot below, he shows a 60s exposure spectrum with HRS in High Resolution (R ~ 72,000) mode (HR), compared to a 40s UVES spectrum. The somewhat lower S/N ratio of the SALT data are a result of the poorer observing conditions for the SALT observation, done on 19 Dec 2013 (3" seeing, some clouds), compared to those for the VLT observations. The observations were conducted by astronomers Lisa Crause and Luke Tyas, with Veronica Van Wyk as the supporting SALT Operator. 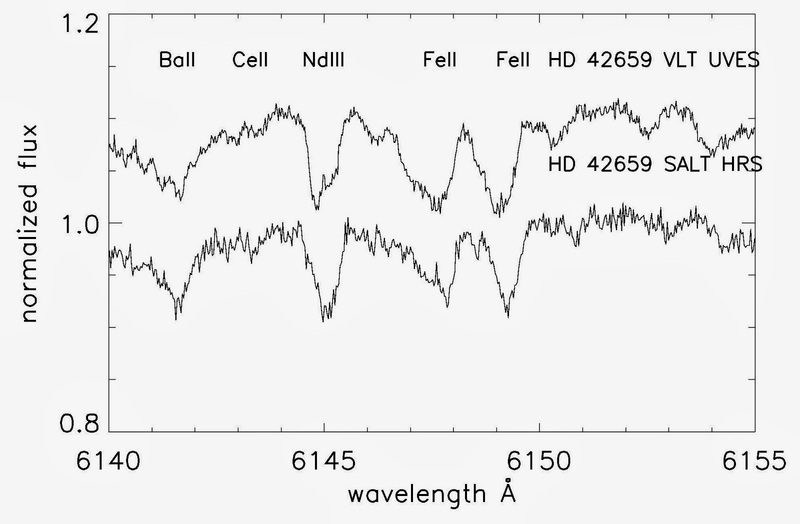 Vladimir comments that the HRS and UVES spectra of HD42659 show differences in the line profiles as a result of spotted structures on the star's surface, resulting in spectral variability, and that the HRS data are good and will be used in radial velocity and abundance analyses. - a mixed bag of conditions tonight. was cloudy at the start of the evening which cleared around 22:00. had moderate seeing for most of the night which improved at the end.